Is it the end of an era, or a new chapter in a beloved mythology? 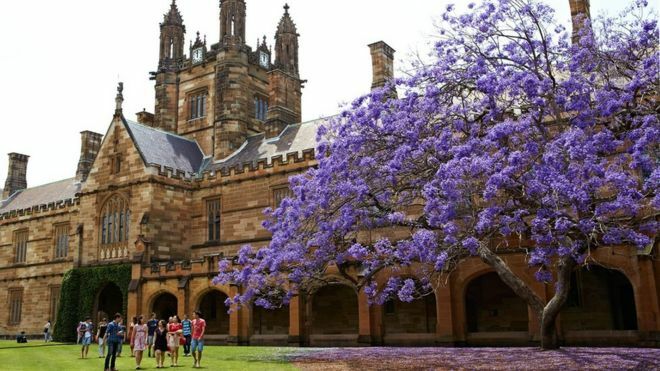 The sudden collapse of the University of Sydney’s famed jacaranda tree has triggered a wave of grief in Australia, with staff and alumni mourning a key piece of campus folklore. The 18m-wide tree had been at the centre of university life and graduation photos since arriving in the main quadrangle 88 years ago. It was also steeped in superstition. A popular myth asserted that undergraduates would fail their exams if they neglected to study before the tree’s first bloom, typically in October or November. The university deemed the collapse seismic enough to send out a press release on Saturday, declaring it was “saddened to advise” the tree had toppled over during the night. The news quickly trended on social media, with tributes saluting the “most famous tree in Australian education” as “majestic” and the university’s “only redeeming feature”. Its death was a “tragedy”. Source bbc.co.uk. Read full article.